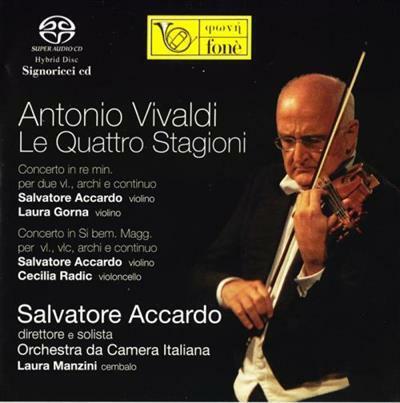 Antonio Vivaldi - Le Quattro Stagioni (Salvatore Accardo) - 2009 [SACD] | Free eBooks Download - EBOOKEE! Posted on 2014-06-12, updated at 2016-05-28, by supnatural. Vivaldis Four Seasons are amongst his most innovative and extraordinary compositions. Todays public knows the work but the "Red Priests contemporaries were immediately captivated by it as well. The originality of these Concertos is that much more surprising because they dutifully follow the usual pattern: division into three movements of Fast Slow Fast with alternating "tuttis and "solos as Giuseppe Torelli used. The Four Seasons in its entirety corresponds with the first four of the twelve Concertos Il cimento dellarmonia e dellinventione op. VIII (Amsterdam, Le Cene, 1725). Here linventione that incites and is one with larmonia, meaning that the Four Seasons were composed according to the rules, heads the four indicative sonnets, one for each season and printed at the beginning of each respective concerto. The unusual creativity lies in the correspondence between poetry and music or rather in the translation into sound of the natural images evoked in the programmed Sonnets. Being an impresario and productive playwright, it was natural for Vivaldi to combine these skills. Concerto in Mi Maggiore "La Primavera"
Concerto in sol minore "L'Estate"
Concerto in Fa Maggiore "L'Autunno"
Concerto in Fa minore "L'Inverno"
No comments for "Antonio Vivaldi - Le Quattro Stagioni (Salvatore Accardo) - 2009 [SACD]".